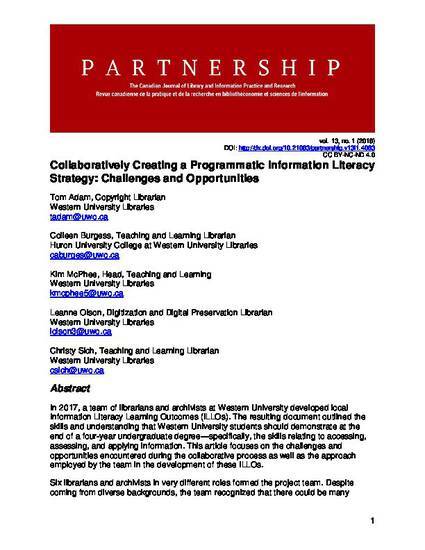 In 2017, a team of librarians and archivists at Western University developed local Information Literacy Learning Outcomes (ILLOs). The resulting document outlined the skills and understanding that Western University students should demonstrate at the end of a four-year undergraduate degree—specifically, the skills relating to accessing, assessing, and applying information. This article focuses on the challenges and opportunities encountered during the collaborative process as well as the approach employed by the team in the development of these ILLOs. Six librarians and archivists in very different roles formed the project team. Despite coming from diverse backgrounds, the team recognized that there could be many Partnership: The Canadian Journal of Library and Information Practice and Research, vol. 13, no. 1 (2018) 2 benefits to developing these outcomes: they could be used as a benchmark for students to measure their own learning, as a conversation starter and leveler with faculty and other instruction partners, and as a stepping stone to develop a full instruction program and common understanding among the librarians and archivists at Western University and Huron University College. The ILLOs created also incorporate guidelines and ideas from various sources, including the Association of College and Research Libraries’ Framework for Information Literacy for Higher Education and Information Literacy Competency Standards for Higher Education, Western University’s undergraduate Degree Outcomes, and the university’s and library system’s strategic plans. To ensure the success of this complex venture, detailed project planning was vital. We consulted with our colleagues through multiple engagement activities: information literacy retreats, focused discussion meetings, and one-on-one consultations. The diversity of roles and experiences of our team members and colleagues added both a richness to our project and specific challenges in dealing with dissenting opinions, information overload, engagement and visioning fatigue, and collaborative writing. This article will discuss our approach to writing collaboratively and valuing diverse opinions to improve colleague and organizational buy-in. We have also included practical suggestions for implementing a similar process at the reader's own institution.